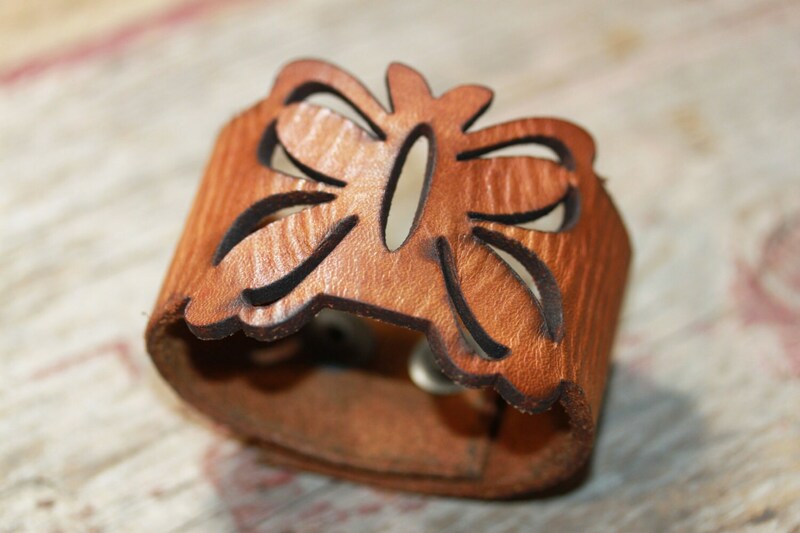 Leather cuffs are all made with premium leather and include two snaps for sizing. The process of how I make the leather cuffs. • First I come up with a design. • Then I gather my materials - Veggie tan premium leather, dyes, snaps, leather sealer and anything else I may need for the particular design. • Next I set the design up in the computer and then run the leather through my laser machine. • After that I clean and dye the leather with eco friendly dyes and seal it. • Lastly I then add the snaps and anything extra I planned on being on the cuff. This cuff has been purposely over worked to give it more of a distressed look. If both buttons are snapped then the diameter is about 2.25" which fits most teens to adults. If one is snapped for a larger size the diameter is about 2.5". What you see pictured is the exact cuff you would get.